In the past few years, concussions in sports have finally gotten the attention they deserve. Prior, many coaches and athletes thought it was part of the game when they ‘got their bell rung’, or ‘were seeing stars’. Currently in sports, everyone from coaches, parents and medical professionals are taking concussions seriously. But we need to realize that concussions are also common in car accidents, falls around the house and by accidentally banging your head. Concussions can be serious because they are caused when the brain is ‘jostled’ within the skull, causing a brain injury. Concussions can’t be determined by an x-ray, MRI or CT scan, thus are commonly missed when they aren’t caused by a sporting activity. To diagnose a concussion correctly, we have to rely on testing functional activities that the brain preforms. By assessing memory, eye tracking and balance, we can start to diagnose the level/severity of the injury. An objective scale can’t measure other symptoms of the injury: fatigue, dizziness, confusion, but also contribute to the diagnosis. Thankfully, most concussions are self resolving within 7- 10 days. For those lasting longer, the timeline can range from 3- 6months to a year. 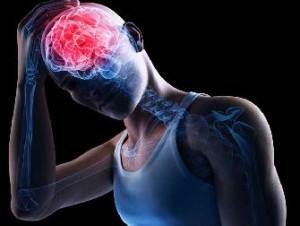 The more concussions one has, also creates a longer time period for healing as the severity of the injury is greater. Symptoms from a concussion don’t always come on immediately. It can take a few hours or a few days for symptoms to occur. One of the most frequent symptoms of a concussion is a headache, but others symptoms include memory loss, confusion, nausea, fatigue, sleep disturbances and sensitivity to light or sound stimulation. Rest is the initial treatment for level of concussion. For mild levels, this includes no exercise or reading for a few days. If the concussion is moderate to severe, resting in a dark room with no light or noise is preferred. Depending upon the symptoms, it might take up to a week or more for symptoms such as headaches, dizziness and fatigue to diminish. Remember concussions are brain injuries, and like any other bodily injury, we use rest to let it heal. Any stimulation to the auditory and visual centers, cause your eyes to focus and ears to listen; thus creating work for the brain. Once the initial symptoms start to subside, treatment involves adding physical activities to challenge the vestibular (balance) and visual (eye tracking) systems of the brain as well as physical exertion levels. Challenging these systems and measuring how the body responds, correlates to how the brain is healing. Concussions are a treatable injury with good outcomes when addressed appropriately. One of the first hurdles in providing appropriate treatment is recognizing signs and symptoms of concussions and seeking medical attention. In addition to rest, physical therapists are an integral part of the recovery process and assisting in returning function to normal.